I became curious about my maternal great grandmother Isabella Liming's sisters when my cousin Ken Redles asked for help in identifying four unknown women in some photos that our cousin David has in his collection. David and I are Liming descendants on our Redles line. After some research, comparing the photos with other photos, and emails back and forth, Ken and I thought that it's possible the photos are of three of the Liming sisters and their mother Anna Morris, but we'd need more clues to confirm. In the midst of this, I realized I know very little about two of Isabella's sisters: Sarah and Anna/Annie. I knew a bit about her sisters Henrietta (born around 1838) and Helen (born October 1, 1847). Henrietta never married and died on November 7, 1915, in Philadelphia. Helen married John H. Scott in 1869. She had one son whom I met when I was 12, Forrest Holmes Scott. She died on April 21, 1924. The oldest sister Sarah was born around 1836. So far, I haven't been able to find out anything else about her. She's listed in the 1860 census with her parents and siblings at the age of 24. Anna/Annie was born around 1841 or 1843. I found a marriage record for Annie M. Liming and Edward J. Tucker who were married on January 15, 1867, at Trinity Episcopal Church in Philadelphia. 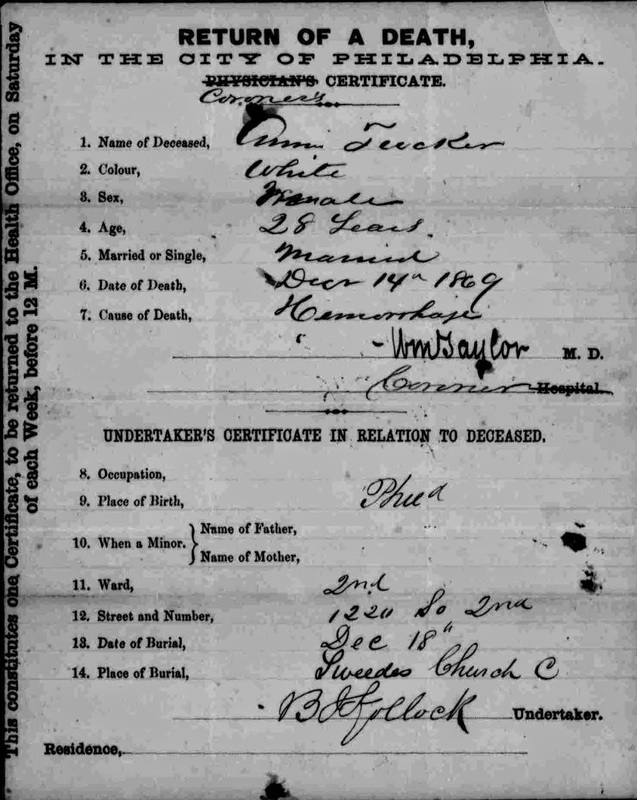 I wasn't sure if she was my Aunt Anna until I found a death certificate for Ann Tucker who died on December 14, 1869. The certificate lists the address of 1220 South 2nd Street in Philadelphia . That is the home of Aunt Anna's parents (my 2nd great grandparents) William and Anna Morris Liming. Then I found Anna's husband Edward Tucker listed in the 1870 census with her brother John Liming and family. I haven't found if Anna and Edward had any children. There aren't any listed with Edward in the 1870 census. The Liming family hasn't been easy to research. Their last name is transcribed in many different ways! Not to mention the many folks who have the same first names as my Liming relatives. This post is part of the 52 Ancestors in 52 Weeks challenge by genealogist Amy Crow at No Story Too Small. Ancestry.com. 1870 U.S. Federal Census, Philadelphia Ward 26, District 6 (2nd Enumeration), Philadelphia for Edward J. Tucker and John Liming.